For some reason, your desktop computer won’t turn on. You’re curious why, so you investigate and open up your CPU tower. Turns out your graphics card has a fungal infection. Reddit user /u/thjake shared the images of the infected GPU on the PC Master Race subreddit, a forum for high-powered rigs. 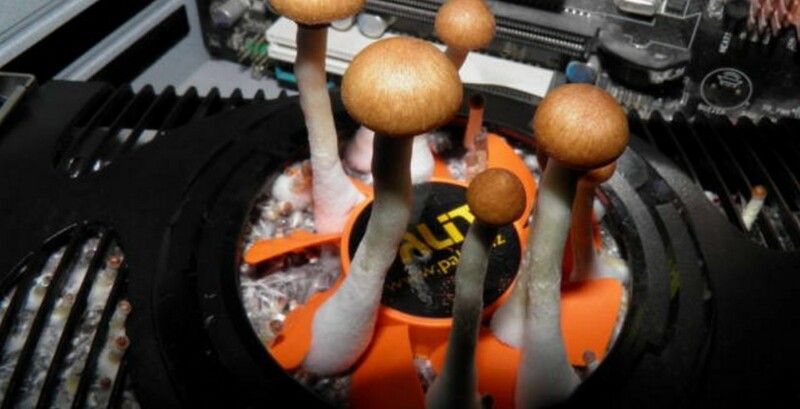 The computer had been unused for a month, so the fungus appears to have grown during that time. Aside from general lack of cleaning, however we imagine the computer was probably kept somewhere damp. As certified Reddit scientist /u/cheelos explains, the mushroom appears to be Psilocybe cubensis, popularly known as shrooms. Yes, that kind. There are few other details about how the mushrooms might have grown, and u/thrjake hasn’t posted anything since sharing the images. Those mushrooms (possibly cubensis), like all other mushrooms grow in the direction of the nearest light source or generally straight up. If these were growing toward the nearest light source from the underside of a gpu they would most likely be slanted towards the grills/fans in the back on the pc at a near 90 degree angle to their substrate. We may never know the truth. Still, unless you’re trying to start a drug business, you should probably clean your PC every now and then. Can’t hurt.